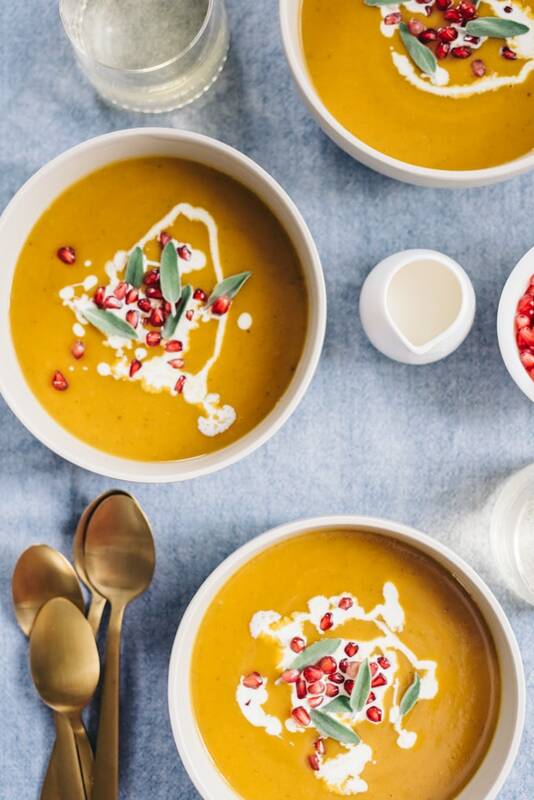 Butternut squash soup with pomegranate is a seasonal nutritional powerhouse. 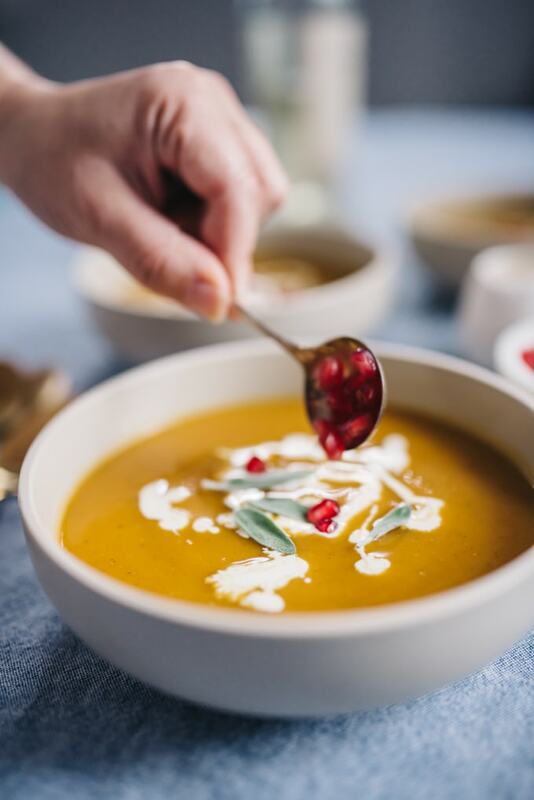 Delicate butternut squash and rich bone broth come together for a velvety soup that is the perfect balance of sweet and savory. 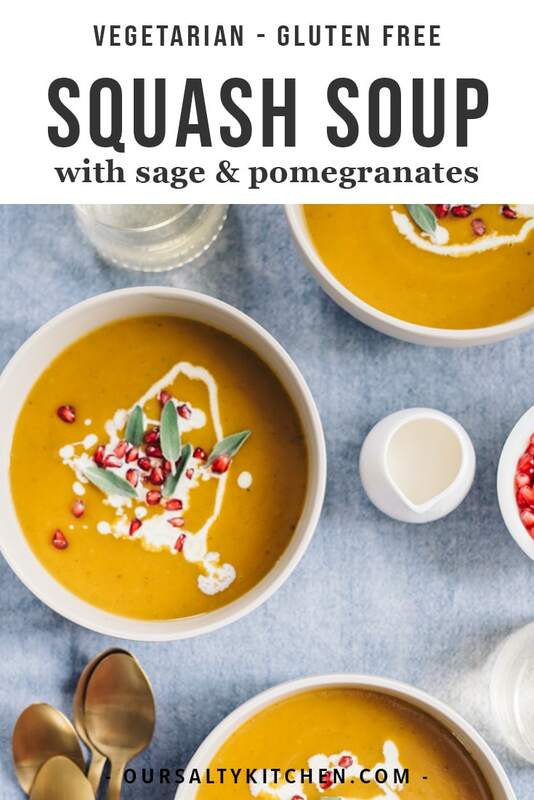 Top this naturally paleo soup with pomegranate seeds for a fun little burst of flavor in every bite! I love soup. I could eat it for breakfast, lunch, and dinner 8 days a week, and I’m pretty sure I did just that in my early 20’s. The husband wasn’t always such a fan, but he became a convert the first time I made him this velvety smooth paleo butternut squash soup. This recipe is basically fool-proof. I swear you can’t screw it up. Back in the stone ages when I was just learning how to cook properly, pureed vegetable soups were a godsend. Poor knife skills? No problem, it all gets blended to bits anyway. Over-seasoned? Fear not, just add extra veggies or more broth. This soup also freezes beautifully, easily doubles, and is easy on the eyes and on the budget. All kinds of #winning happening up in this soup. I specifically use chicken bone broth in my butternut squash soup. If you’ve never made bone broth before, shame on you. I kid, I kid. But in all seriousness, it’s a must-try. Here is an awesome tutorial on how to make your own. You haven’t lived until you’ve had home-made bone broth, plus it has all kinds of amazing nutritional benefits that you’ll never get from chicken-flavored-water boxed broth. If you’re going to make your own, do it up right – pony up the cash for at least an organic (but preferably pastured) chicken. Your taste buds will thank you, and so will I. Bone broth works so well here because the high gelatin content gives the soup a super velvety texture. It’s also a subtle savory offset to the butternut’s sweetness. And like I said, nutritional powerhouse. When you combine it with in-season squash and fresh herbs, you won’t need to take your vitamins for like, a day. Consistency is key to taste, so you want to blend this soup to within an inch of it’s life. I love a handheld stick blender for its convenience and easy clean-up, but a standard blender also works. For many soups I prefer a standard blender because it does a better job at super smooth pureeing, but in this case the squash is so soft and delicate that a stick blender works perfectly, and the clean-up is way easier. If using a standard blender, allow the soup to cool slightly first and to blend in batches to prevent pressure build-up. Go forth and blend like crazy, because nobody likes chunks in their soup…unless those chunks are pomegranate seeds, and in that case, garnish away. Years ago, a friend tipped me off to adding pomegranate seeds. 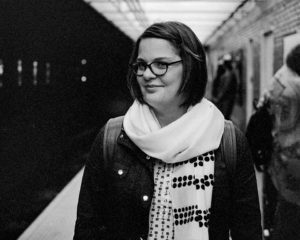 I, too, was skeptical, but I’ll once again ask you to trust me. Taking a bite of this sweet-savory manna from the gods and then getting a burst of pomegranate seed is transformative. It’s basically an antidote to seasonal affective disorder, and way cheaper than those daylight lamps. So crack open a pomegranate already and get to work. You’re welcome. 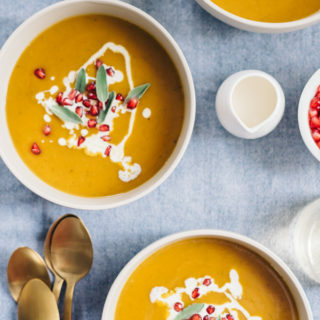 Butternut squash soup with pomegranate is a seasonal nutritional powerhouse. 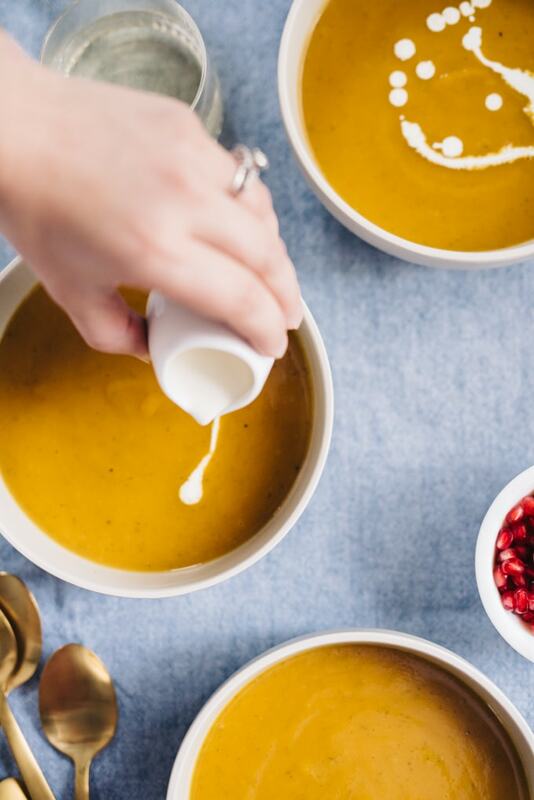 Delicate butternut squash and rich bone broth combine to make a velvety soup that is the perfect balance of sweet and savory. Pomegranate seeds add a fun little pop to every bite. 1 large sweet onion diced to 1/2"
Using a 6-quart dutch oven, heat the butter over medium until it foams. Add the onion and cook, stirring occasionally, until soft and browning around the edges, 7-8 minutes. Push the onions in the center aside, add the garlic to the pot and cook, stirring continuously, until fragrant, 1-2 minutes. Sprinkle the sage over the onions and garlic and cook, stirring continuously, for about 1 minute. Add white wine and deglaze the plan, stirring until the alcohol cooks off and the wine stops bubbling, 2-3 minutes. (If you are omitting the wine, use 1/2 cup of the vegetable or chicken broth). Add the squash, broth and salt and pepper to taste and stir all ingredients. Add thyme and bay leaf, increase heat to medium-high and bring the liquid to a boil. Then, lower the heat to medium-low and simmer, covered, for 20 minutes or until the squash is soft. Discard the bay leaf and thyme. Add 1 tbsp fresh chopped sage. Blend all ingredients with a handheld stick blender. If the consistency is too thick, add water or broth 1 tbsp at a time until desired consistency is reached. Taste for seasoning and add additional salt, pepper, or sage. 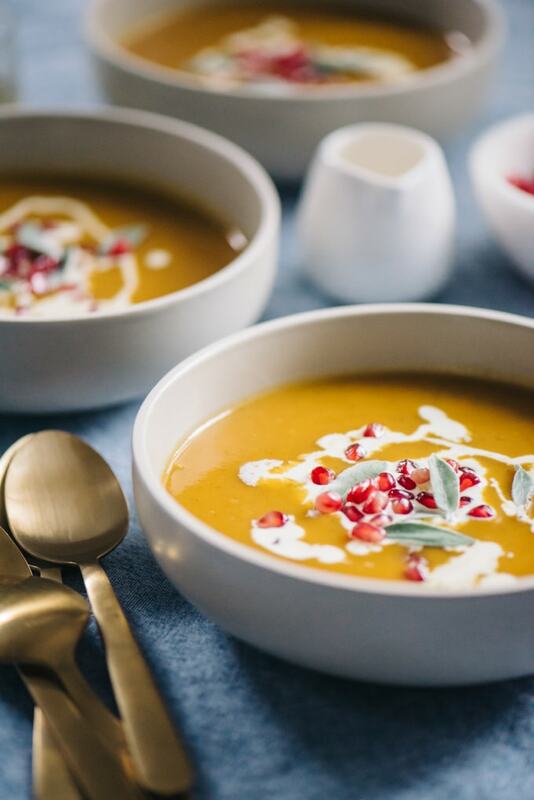 Ladle into soup bowls, garnish with coconut cream or heavy cream, additional fresh sage and pomegranate seeds. Serve immediately. Leftovers can be kept in the fridge in a tightly sealed container for up 5 days, or in the freezer for up to 3 months.